You guys know who Rudy Obrero is, right? He’s the talented artist behind many of the box art pieces from the original Masters of the Universe toy line, and the man responsible for the beautiful artwork seen on the MOTU Classics Wind Raider, Map posters, and the upcoming Granamyr. 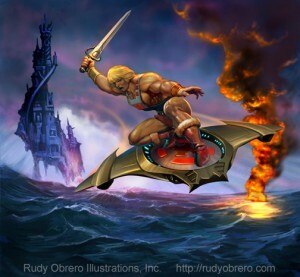 Not too long ago he posted some brand new artwork depicting He-Man flying over a sea on a hover board-looking device that Rudy created just for the painting. He called in The Manta Raider. 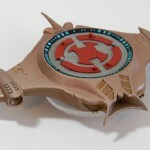 Soon after, talented toy maker Joe Amaro recreated The Manta Raider in plastic! It was a perfect representation of the device seen in Rudy’s painting. After seeing this, many fans said they would love to add this piece to their collections. Well, fans are finally going to get the chance to do just that. Joe and Rudy have teamed up and will be releasing the Manta Raider to the public! At the He-Man.org Power Party I finally got a chance to sit down and talk to Rudy Obrero face to face. At the party Rudy told me that he wants to make the Manta Raider available to the fans!!! I need to figure out the logistics and price but it will be a very very limited run, definitely under 100. We talked about having it in some type of packaging so we can use Rudy’s awesome painting! The plan right now is to have it ready for Power Con in September. Rudy will have a table there with some prints for sale. Best of all you can have all the items signed by Rudy! I don’t know about the rest of you, but I find this news pretty exciting! I’ll be sure to keep everyone posted as more information becomes available! Note: This is just a fan project and not associated, licensed or in any way affiliated with Mattel or Masters of the Universe. It is a piece of hand made fan art, and not a toy. I'll buy that if I have the opportunity to ! That's too cool! Hope I get the chance to buy one! 100 is SUPER limited and I'm sure the masters of the faniverse will be battling it out to get one. Damn only 100? man I hope I can get me one of these! I'll be at Power con…Hope they don't sell out before i can grab one! Only 100?! 🙁 Unless they limit 1 per person. Who is to say that someone won't buy like 50 of them and resell them 3 times the value? I doubt that will happen. You have to remember that this is a hand made, hand painted piece and is not mass produced. It is not a toy. This is how these hand made pieces work. They have to be in small runs. They will likely be a little expensive as well, so be prepared for that. That's also common for small run stuff like this, becuase it's a lot of work and money to produce these yourself. I highly doubt someone will walk up and buy 50. Even if they tried, I doubt Joe would allow that. I think they should take pre-orders, because I really would want one. Sounds like something perfect for Kickstarter. Which I would totally back. Not really loving this one. Maybe if it lit up it would be more interesting. Still waiting to get the Mystic Hammer! Dan, did you say he has paintings for the upcoming Granamyr box art? I never really heard about that and was wondering if it was confirmed. I'm super stoked if thats the case. Huge box art fan here. Like Dan said these are all hand crafted, not manufactured, so I can only make so much. This is by far the most complex project I have ever done! The plan is to have it available for Power Con at Rudy Obrero's booth. It's not a Power Con exclusive, that's just where we will have it first. We do plan on offering it again online. We are going to limit them to one per person, since we only have very few. I am thinking about per-ordering them, just so we can avoid the craziness at the con. It's just difficult to organize, but I'm looking into it. The response has been really awesome, Rudy and I could not be happier! Thanks for all of the info, Joe! I had too!!!! !….I have been keeping this since before SDCC!! !…Do think fans will guess we are making custom Pixel Dan ice trays? 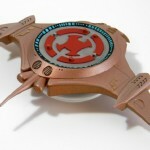 I can't wait, the manta raider is insanely cool, just put I pre-order and I'll order mine!